Shroud of the Avatar has never been bereft of interesting ideas or experimental initiatives. One of these is getting a live preview today with Release 57, as everyone can check out the potential for player-made dungeons. While for-real player dungeons won’t be coming until Q4 this year, Portalarium did make five temporary ones available to place in and around player housing to see what they will be like. There’s also an effort underway to fund the second issue of the Shroud of the Avatar comic book. This officially-licensed issue will be 32 pages long and only needed $700 to fund (which is has already surpassed). I cannot express enough how I am constantly disappointed by this game. It is by far one of the worst examples of what to do when developing a game, while utilizing crowdfunding. 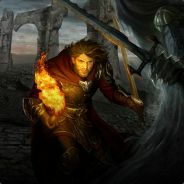 A game that was supposed to be selective multiplayer (think Divinity Original Sins 2) has become a lifeless MMO that is kept alive by RMT and high level backers. The game’s mechanics never worked because they were simply half-baked to begin with, which is why you are seeing them get removed now. Rild is a good person. Good luck on your Kickstarter. Still trying to avoid having to get real jobs I see. When said quickly, these changes don’t seem like much. But in reality, removing the control point and siege slowdowns on the map is huge. We should see a lot more people running around instead of teleporting everywhere. The new loot window (no more squinting + less screen space needed) and the global banks are a big deal as well. Many of the new player complaints have been addressed already (jump, focus drain) and this just smoothed out the game a whole lot more. It’s coming along VERY nicely. A couple more of the many goodies: aggro and summoned elementals got a balance pass (yes!) and helmets can now be hidden. Check out the update, it’s over 7000 words, which equates to tons of bug fixes, new things, and adjustments. You insist that you’re not shilling for Portalarium, which may or may not be true. If you aren’t being paid, though, you really ought to be. 404 error on that Kickstarter link. Replace “beginings” with “beginnings”. There is a typo in the link. Good catch. That fixed it. They raised millions of dollars and still need to e-beg to produce a relatively paltry $700? Where is the money going? Swag. Literally nothing but swag. Link in article was broken, but literally every ‘stretch’ goal is “Hey, now you can pay us more money to get a pin! And by doing that, we’ll hit a goal for stiiiiickers and flipbooks!”. The comics are done, everything has been paid for and in the risks section even they admit this is pretty much a joke of a kickstarter. You’re paying for them to make physical crap, not funding them to make the comic. Oh, I’m not paying them for anything, lol. Wasn’t saying you were. The ‘you’ is in the generic sense, not specific. Portalarium is not making this, it is created by fans. Just shut it down already.